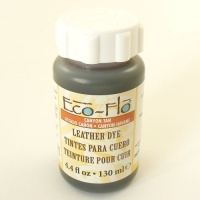 Tandy Eco Flo Leather Dye is a transparent, water based, low VOC penetrating leather dye, suitable for use on undyed vegetable tanned leathers. It can be used to cover whole areas of leather, or to pick out small details in your stamped or carved design. To use, shake well, apply evenly with a wool dauber, brush or sponge. 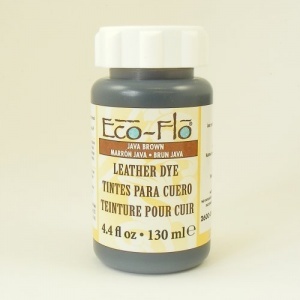 You can build up several coats of dye, but it's always best to let the first coat dry and to rub off excess pigment from the surface before applying your next coat. 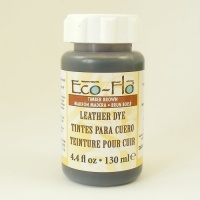 Once you've finished dyeing your project, buff off excess dye and seal the surface of your leather using a protective finish such as Tandy Super Shene or Tandy Satin Shene. This is a 130ml bottle of dye.